This past week I have been working away on the corner block that finishes off the third border on Sue Garman’s “Friends of Baltimore”. I get goosebumps just thinking about how close I am finishing this once-in-a-lifetime quilt!! First, I traced the design on the background with a Clover water soluble blue marker. I always like to start with the vase. Next, I added the base. Next came the decorative oval and I knew I just had to use this gold swirly fabric. I used this fabric already on this vase and I loved the effect it gave. Something told me the red vase was lacking something, but what? The two fabrics have a lot of motion going on and I needed to separate the red and the gold swirly fabric. So I cut a freezer paper template just a little bigger than the gold swirly piece. Using this new template, I cut an oval out of the same gold I used on the base, placed it underneath and voila! Once I was over that little hurdle, I was ready to start filling the vase! I stitched the block to the border so that I could continue adding the flowers and leaves. Since the right-hand side of the block is complete (and everything is stitched in place, I might add! ), it is now time to add the border to the rest of the quilt. Now I can start to fill in the left-hand side of the block. So far, so good! Still here? Good! Since I already had my sewing machine out, I decided to put the binding on my Grandmother’s Flower Garden quilt. First, I carefully trimmed the quilt so I had straight edges to work with. 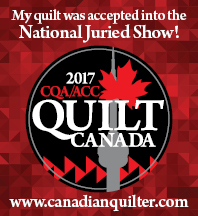 I am always a little nervous when putting my rotary cutter anywhere near my quilts! I always mark the line I am going to cut with my blue marker, just as an extra safety precaution. I chose a bright orange polka dot for the flange. I cut the pieces 1″ wide and pressed them in half lengthwise. Then I stitched them to all 4 sides of the quilt. The folded edge is towards the middle and the raw edges are lined up with the edge of the quilt. Next, I cut my binding strips, joined them into one long strip and pressed them in half lengthwise. I stitched the binding on as usual, on top of the orange flange. So, now I am going to make a pot of tea and spend the afternoon hand stitching the binding. Sweet! « Stitching the weekend away…. :You are on a roll, girl!! Love the Baltimore and the Grandmother’s Garden with the orange flange!! Really neat!! That tiny polka dot is perfect for the flange – its going to look great! I love your vase of flowers – just beautiful! Once in a lifetime is right and it is simply gorgeous, Kerry! Love how you’re finishing the GFG. I invite you to link to Hexie Weekend to show this great process report. Ends Monday, midnight. The orange was a perfect fit! I want to come over from New Zealand and live next door to you Kerry. I want to share your pot of tea (drunk from china cups of course) and hand stitch alongside you while we chat and occasionally rub our necks, sore from bending over our work! I want to solve the worlds problems, plan our next hand stitching projects and just “hang out”. Sigh. LOVE the orange flange!! Just knocks this quilt out of the ball park. How did you sew the orange flange to the corners?? Did you just bend it around the corner or did you treat it like binding? Did you fold it somehow?? Thanks! I absolutely LOVE the way you did the binding on the hexie quilt. I may try that on one of the wall quilts I’m working on. As always your applique is exquisite and I am in awe! I love the finish on your hexagon quilt. That little orange flange is a perfect pop of colour! I’m new to your blog (which I LOVE, BTW!!) and wondered what your applique process is. Do you needle-turn, use Heat-and-Bond (or something similar), or is it raw-edge?? You seem to get so much done in one sitting, it amazes me. Love your work 🙂 The GFG is gorgeous, too. Love the Vase and the gold print that you used. Fussy cutting is fun and adds so much to our work. I also like the way you did your binding with the flange………….Really makes the quilt binding pop. Enjoy your progress and hats off to you for doing all that beautiful work – hard work – on your Baltimore quilt. Truly a once in a lifetime quilt!